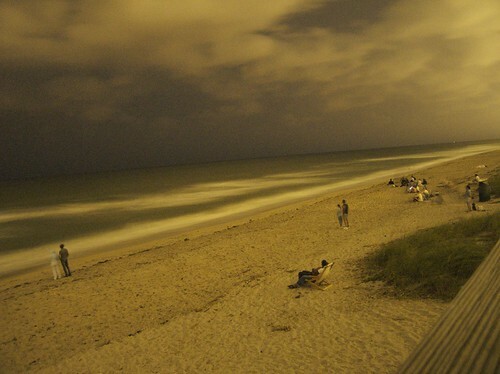 Delray Beach during a lunar eclipse. The charming community of Delray Beach, in Southeast Florida, is 100 years old this year. It’s come a long way since it was first settled in 1911, but it still embraces and celebrates its history. Consider spending some time in Delray Beach, Florida Bed and Breakfasts while you explore this interesting town. Less than a decade ago, Delray Beach was a sleepy community nestled midway between Palm Beach and Fort Lauderdale. Those who knew it appreciated its beautiful (and uncrowded) beaches, lovely historic architecture, and relaxing atmosphere. It still has all those attributes, but it has blossomed into something more. Delray Beach today boasts a main street with more than 100 galleries, boutiques, cafes and eateries. The cuisine in Delray Beach is top notch and varied. Enjoy pan-Asian food with flair and drinks in the glass atrium at Buddha Sky Bar; relax with a glass of wine and traditional French fare at Cafe de France; tuck into plates of fresh, organic food at Ciao Sidewalk Cafe; and feast on tasty steak at sleek, modern Cut 432. If none of these are to your liking, fear not – there are dozens more restaurants in Delray Beach. The Delray Beach Art District is comprised of more than 20 art galleries featuring glass work, fine arts, sculpture and more. The events calendar is filled with wine tastings, art shows, historic trolley tours, and concerts. A handful of nightclubs allow the energetic to dance until (almost) dawn. Delray Beach is worth getting to know. Make yourself at home in a Delray Beach, Florida Bed and Breakfast. You won’t regret it. This entry was posted on Tuesday, October 4th, 2011 at 4:31 pm	and is filed under Southeast Florida. You can follow any responses to this entry through the RSS 2.0 feed. You can leave a response, or trackback from your own site.